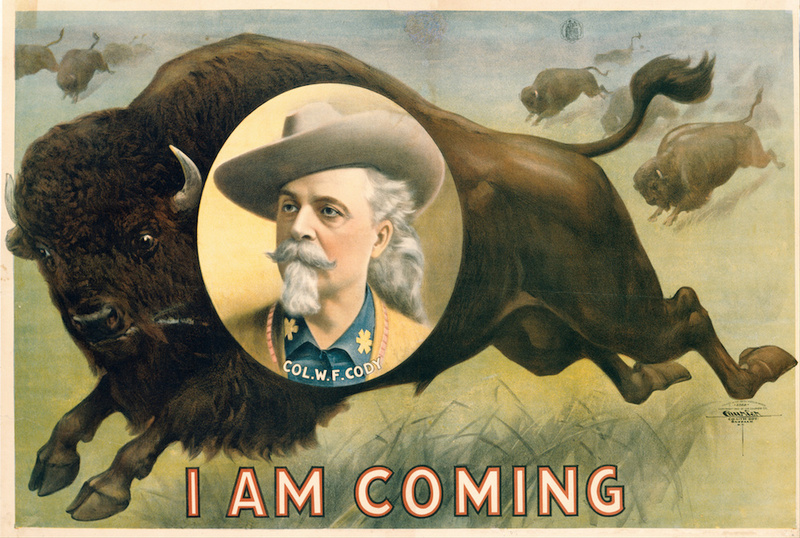 Buffalo Bill poster, 1900, by the Courier Lithography Company. Courtesy of the National Portrait Gallery/Wikimedia Commons. To appreciate the wonder and luster of a star in the sky, one must look off to its side—“averted vision,” it is called. So it was in the late 19th century with the rising star of republics—the United States—and with the man who, more than any other, came to epitomize our nation’s drive, character, promotional flair, and obsession with celebrity: William F. Cody. In the second half of the century, Cody, also known as “Buffalo Bill,” achieved a measure of renown in the United States as a Pony Express rider, plainsman, buffalo hunter, and military scout. Brave, rugged, handsome, and decidedly Western, he was the subject of hundreds of popular dime novels and became a stage actor portraying himself in a series of shoot-’em-up dramas that were wretched productions but nevertheless titillated theater-goers. 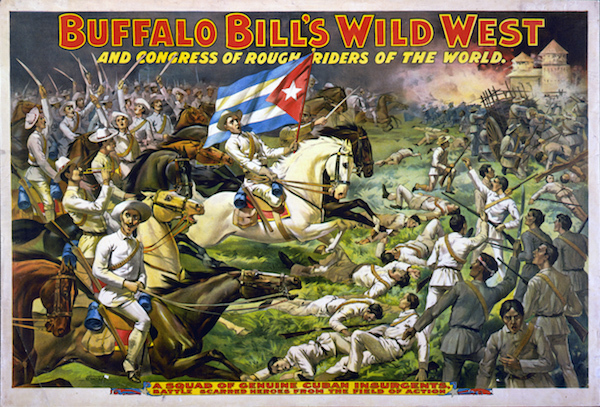 Starting in 1883, his action-packed outdoor arena show, “Buffalo Bill’s Wild West,” attracted large audiences in places like Lancaster, Woonsocket, and Zanesville. Still, it wasn’t until Cody took his act to Europe, in 1887, that Americans truly began to revere him as an exemplar of national character. The Wild West was a huge hit in Britain. One million people saw the show, including statesmen (members of Parliament, and once-and-future Prime Minister William Gladstone) and famous actors (the estimable London actor-manager Henry Irving told one newspaper that the Wild West would “take the town by storm”). Queen Victoria emerged from seclusion to visit the show two days after it opened and enjoyed it a second time 40 days later during a command performance at Windsor Castle. The audience that day included many other kings, queens, and members of European royalty who had come to town to celebrate her Golden Jubilee. W.F. 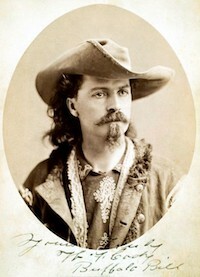 “Buffalo Bill” Cody in 1875. Courtesy of the George Eastman House Collection/Wikimedia Commons. Their adulation was picked up by the British newspapers, and that press coverage was then amplified by many American periodicals, which eagerly chronicled Cody’s every move through London society. The New York World observed that Cody was already as well-known to the masses in London as the queen. “You could not pick up in the most obscure quarter of London any one so ignorant as not to know who and what he is. His name is on every wall. His picture is in nearly every window.” The magazine Puck joked that Cody was mostly spending his time playing poker with duchesses. Other publications speculated that Cody might be knighted. None of this happened by chance. Cody’s trip and its newspaper coverage had been engineered in large part by a burly, brilliant, sombrero-wearing press agent named John M. Burke, a man with a genius for promotion and a keen sense of what it meant to be American. Upon first meeting Cody in 1869, Burke had recognized the scout’s quintessentially rugged Western character and universal appeal. “Physically superb, trained to the limit, in the zenith of manhood, features cast in nature’s most perfect mold…,” Burke wrote later, Cody was “…the finest specimen of God’s handiwork I had ever seen.” Burke himself was somewhat rootless—born to Irish immigrants who died when he was an infant; raised in a succession of towns and homes; trained as an itinerant theater manager, newspaperman, and scout. Perhaps for this reason, he intuited his countrymen’s emerging, visceral desire for belonging, and the prospect that Cody was an identity the American people could latch onto. This was a remarkable insight from a man who seemingly had a crystal ball (as early as the 1890s, Burke predicted that women would get the vote, world war would break out in Alsace-Lorraine, and a member of a minority group would become president of the United States). For in the years following the Civil War, American identity was still on the blacksmith’s forge. The Republic had been formed during the lifetimes of people still alive to tell the tale, and it had been re-formed by the War Between the States. But there hadn’t been many prominent Americans in world or cultural affairs since the days of Jefferson and Franklin. Perhaps the most clearly identifiable American trait was neither intellectual nor artistic, but simply the enterprising, brash spirit of “Yankee push” best exemplified by P.T. Barnum, who was somehow both laudable and horrifying. 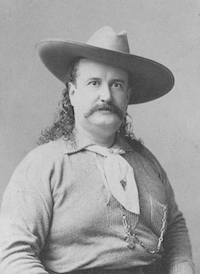 John Burke, the marketing force behind Buffalo Bill. Wikimedia Commons. And so, unsure of its place, unsteady in its path, America looked across the ocean for validation. Writers, artists, statesmen, and entertainers from the United States sailed to Britain and the Continent to measure their growth and worth. The painter George Catlin, who had earned praise for his portraits of New York Governor DeWitt Clinton and General Sam Houston, and fame for his sketches of 48 tribes of American Indians with whom he had lived, still found it necessary to seek true legitimacy through a tour of London, Paris, and Brussels in the 1830s and ’40s. Even Barnum, famous and successful as he was, felt compelled to take one of his popular acts—his distant cousin Charles Stratton, also known as General Tom Thumb—on a similar sort of corroboration tour of Europe in 1844-45, appearing before audiences that included queens and tsars. But Burke managed to do something with Cody and the Wild West that the earlier cultural exports never could. He burnished and redefined the American reputation by reflecting it in the shiny crowns of the Old World’s beloved monarchs, juxtaposing ancient and modern and thus validating the appeal of a new kind of American: the Westerner. He accomplished this by applying groundbreaking marketing tactics to promote a sort of on-the-sleeve patriotism throughout the Wild West’s tour of Britain in 1887-88, and during a subsequent tour of the Continent in 1889-92. And so Burke transformed the flesh-and-blood Cody into the almost mythic Buffalo Bill, a man whose spur-jingling acts of derring-do embodied America’s heroic past—and whose entrepreneurial wrangling of the world’s most successful entertainment property foretold of America’s promising future. Burke consciously crafted a new Western American self-image, in a rifle-toting, money-making, entrepreneurial husband-father and cultural conqueror who looked dashing in buckskins and dapper in business suits. For millions of Americans, Cody represented a new and uniquely American persona to which they could relate. An 1898 advertisement for the Wild West show. Courtesy of Wikimedia Commons. It all paid off handsomely. The Wild West returned to American shores triumphant, greeted dockside by thousands of grateful well-wishers. The show thrived, and in 1893 enjoyed its most successful season ever, a six-month stand outside the gates of the World’s Columbian Exposition in Chicago that played to full houses twice a day and raked in $1 million in profits. Soon, Burke would even float Cody’s name as a presidential candidate. In the ensuing years, John M. Burke and William F. Cody continued building the Wild West brand, though mostly on American soil. What had begun with an averted vision across the Atlantic was now an American star of a completely different magnitude. Before it was all done in 1916, they had performed in front of 50 million people, and had carved out a place for Cody in that strange eternal pantheon of larger-than-life legends, where real people and fictional ones (George Washington, Johnny Appleseed, Davy Crockett, Paul Bunyan, Pecos Bill, John Henry, Babe Ruth) dwell side-by-side in a murky world of perpetual stories, myths, and singsong nursery rhymes. When Cody died in 1917, the country mourned in a way it hadn’t since Lincoln’s assassination. Around 25,000 people ascended the tortuous path up Lookout Mountain in Colorado to attend his funeral. But perhaps the most important legacy of Burke and Cody was the double-barreled contribution they made to the new sense of American identity: a crystallized articulation of the Western ideal that would find expression in everything from the Hollywood Western to the Marlboro Man to Ronald Reagan; and their incredibly shrewd use of promotion to build celebrity and leverage it for commercial success. In that respect, Burke and Cody may be more a part of American life today than they ever were in their own times. Joe Dobrow is a former marketing executive at Whole Foods Market, Sprouts Farmers Market, and Discovery Channel, and is the founder of MBArk, an educational program for food industry leaders. He is the author of Pioneers of Promotion.